It is one thing to determine that your child is being bullied. it is another thing to know what to do about it so that you can help. Although your inclination might be to confront the bully or the bully’s parents (who can forget the Brady Bunch “bully episode” when Buddy Hinton was teasing little Cindy…”Baby talk baby talk, it’s a wonder you can walk.” ) help might best come in another form. ** Ask direct questions of your child. For example, if your child comes home with a torn jacket, ask specifically how the jacket was torn. Watch carefully for your child’s body language as he answers this question. If your child is losing weight, ask him if he is eating the lunch that he brought to school or if something was amiss with his school lunch account. Make sure you get an answer. ** Get the school’s bullying policy from their website online. Thankfully schools are more aware of bullying and have policies in place to thwart it. It is fascinating what a parent can find out when driving kids. For some reason, kids think that the parent driving the car has lost his hearing! You can glean information this way or simply ask the friend if anything is going on at school. If you can not get information from your child’s friend, a friend’s parent might have heard something that would be useful. ** Ask your child which teacher or counselor at school they trust at school. Contact that person for advice. ** Most importantly, seek the help of a health care professional to help your child and come up with a plan to address it with the administration at your child’s school. Start with your pediatrician’s recommendations. 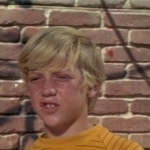 In the Brady Bunch bullying episode, Cindy’s brother Peter defends Cindy against Buddy, the bully, and gets himself a black eye. Peter’s father, Mike, says for Peter to reason with the bully, first, and then it is ok to defend himself as a last resort. Today, the advice would most likely be to let the school handle it before it becomes physical. Nonetheless, at the next confrontation, Peter is forced to defend himself and lands a right hook on Buddy’s jaw. The punch gives Buddy a lisp of his own..the exact same quirk that Buddy used to tease Cindy. When Cindy, who was watching the fight, starts to then tease Buddy, Peter quickly scolds her and the group gathered to watch ‘the fight.” It is never ok to tease. 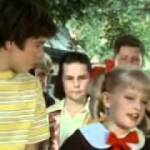 Surprisingly, Buddy ends up at the Brady residence to apologize to Peter and Cindy and to ask Cindy if he can borrow her tongue twister books to help with his new lisp. I am reminded of Bully Bean who after mercilessly torturing Lima Bear, needs Lima Bear’s help when he gets stuck. Just like Cindy, Lima Bear is there to help the bully and is bullied no more. Can You Recognize the Signs of Childhood Bullying? No one likes a bully, least of all a child who may not know how to handle such mean behavior. It is important for parents to recognize the signs of bullying reflected in your child’s behavior so you can help them to do something about it. 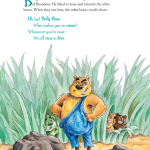 In the Lima Bear Book, Bully Bean, the bullying behavior is easy to spot. Poor Lima Bear is tossed into a hole that he was too small to crawl out of himself. As if that were not enough, he was also pushed into a mud puddle. 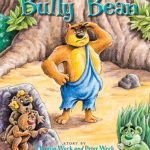 Lima Bear has an opportunity to deal with the bullying by showing kidness when the bully of all bullies, Bully Bean, gets trapped. Not all children have such an opportunity to turn the tables on the situation and they may need a little help to cope. Dr Michele Borba, author of The Big Book of Parenting Solutions, says “… bullying is starting at younger ages and may be more intense.” Also that, “…our children don’t always tell us that they have been bullied.” This means parents have to be more vigilant than even when assessing changes in our children and watchful for signs of bullying. Dr. Borba outlines 19 signs that your child may be being bullied. Here are just a few from her list. …have a marked change in their personality? …suddenly NOT want to go to school? …have a change in eating habits? either too much or too little? …have a drop in grades? or do YOU feel in your gut that something is just not right with your child? Any of these changes in your child could signal that your child is being bullied. In our next post we will examine the steps parents can take if they suspect bullying. Hang in there. There are ways you can help.